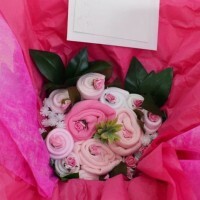 A Gift Box containing Bibs, Bodysuits and Socks in Pink and White. Beautifully finished with Rose petals, Mulberry paper flowers and other artificial foliage wrapped in matching tissue paper and floristry wrap. This comes complete with a floristry card and envelope and is attached to the gift box with a peg.